The flu season is here, so please support your practice by having your jab at Testvale Surgery! Seasonal flu vaccination is recommended each year for people with certain clinical conditions that could put them at risk, so please check below for your own eligibility below and call us on 02380 866999 to book your appointment. Please note that children between the ages of 4 years and 10 years will be given at school and not in the surgery. 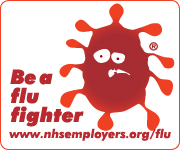 Booking for the flu vaccination clinics are now open. There will be lots of clinics available to choose from on week days if you are able to get to the surgery, or at evenings and weekends and so there will be availability at a time to suit you. 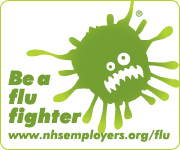 Call us on 02380 866999 to book your flu jab now. For housebound patients Sister Palmer will visit in early November 2018. Testvale Surgery will send patients text message reminders for flu vaccinations, as well as writing to at risk patients. Please make sure you have informed the surgery of any changes in your mobile telephone number. Complete a slip on the reception desk to let us know of any telephone number changes. a quadrivalent injected vaccine. (Influvac) This is for adults aged 18 and over but below the age of 65yrs who are at increased risk from flu because of a long-term health condition. This year, the surgery will offer the flu vaccine to all 2 and 3 year olds. Children aged 4 to 9 years old will be vaccinated at their school. For most children the vaccine is given as a simple nasal spray. If there are any reasons why it should not be given, an injection can be given as an alternative. If you child is eligible for the flu vaccination the surgery will contact you by letter. Why don’t you come down for your flu jab then? Book an appointment with the reception team today on 02380 866999! However, if you are unable to attend the surgery and would like a home visit please ring the surgery on 02380 866 999 and we will be able to help. For housebound patients Sister Palmer will visit in early November 2018.